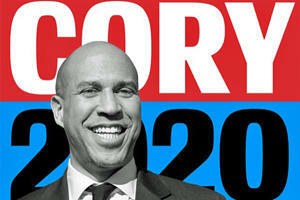 U.S. Sen. Cory Booker, D-N.J., the latest Democrat to throw his hat in the ring for the 2020 presidential election, developed a national reputation in part through his effortless command of social media. But Booker’s ubiquity on platforms like Twitter and Facebook could become a problem, according to one political science professor, who said the progressive wing of the Democratic Party has also used the internet to reach voters and may hammer Booker on parts of his record. “He’s going to have to confront the emergence of this progressive movement nationally that has in many ways been propelled through social media,” said Domingo Morel, an assistant professor of political science at Rutgers University-Newark. Morel said newly-elected progressive Democrats like U.S. Reps. Alexandria Ocasio-Cortez, D-N.Y., and Ayanna Pressley, D-Mass., as well as veteran politicians like Sens. Bernie Sanders, D-Vt., and Elizabeth Warren, D-Mass., have all used social media successfully to explain policy ideas or bash opponents. As mayor of Newark, Booker supported vouchers for private schools and presided over the expansion of charter schools in the distressed city. The 49-year-old Democrat also raked in political contributions from Wall Street and the pharmaceutical industry. Morel said that leaves Booker vulnerable to social media attacks from Democrats who view him as less progressive than they are. Yet Booker has also championed policy ideas shared by some progressive Democrats, including Medicare-for-all and the legalization of marijuana at the federal level. Still, the professor suggested that Booker’s expert grasp of social media would allow him to speak to many voters directly and portray himself however he saw fit. Booker, who had long been rumored to have presidential ambitions, announced his candidacy Friday morning in a video posted — not coincidentally — online. Following the release of the campaign video, he made a string of media appearances in which he laid out a platform that he said would focus on unity and reaching out to those who felt left behind by the government and the political process. Booker joins a growing list of Democrats opposed to President Trump who are jumping into the 2020 race, including his U.S. Senate colleagues Kirsten Gillibrand, D-N.Y., and Kamala Harris, D-Calif.
Booker was first elected to the U.S. Senate in a 2013 special election.